← 4. Climbing the stairs — to what? There are so many unfortunate realities presented in this comic. Think about the quandary of the Millennial Generation: not only do many young American’s face their own personal student debt, but they also bear an incredible national debt of over $14 trillion, plus obligations to fund other future liabilities. Have we given the Millennial Generation an asset or liability? American student debt has ballooned out of control, reaching an aggregate of over $1 trillion in outstanding student loans while 1 in 2 new graduates are jobless or unemployed. Former Virginia Secretary of Education, Dr. Wade Gilley, writes in an Op-Ed entitled Is this America’s next financial bubble? There are many unemployed or underemployed graduates facing this painful reality, and unfortunately many younger students who are positioned to rack up educational debt do not really understand the implications. Even the financiers want to steer clear of student loans in their portfolios because their high risk of default is proving to be a bad investment. This is a national predicament, not only for the student, but also for America as a whole. The poor economy is certainly to blame, yet I believe there are other reasons for this dilemma that have been trending under the surface long before the economic doldrums. The price tag on tuition is up, and the cost of borrowing is inevitably poised to increase. On top of that, the economic value of that coveted diploma is worth less than it was in decades past and does not get one as far. Plus it’s taking students longer to graduate—up to 5 or 6 years—while they change majors 2 to 3 times. Too often many students enter college having no clue as to what they want to do and graduate without much more direction. This is not a good equation for our young or for our nation. Do you think this is a reality? Why do you think this is happening? And what could be done about it? How can the institutions of higher education be held accountable? Consumers (students)? Parents? Lenders? 5 Responses to 5. Economic reality? Student loans are a great way to achieve an education, but our education on students loans is far from reality. If we painted the portrait of what $80k in student debt means for a graduate then maybe the number one option for getting through school wouldn’t be to get a loan. People might resort to getting a job to pay their way through school and take 9 credits instead of 15. Or find a school that values providing an education at a reasonable price. This kind of market pressure would ultimately reduce the price of college in every State. Unfortunately there are a number of reasons why this doesn’t take place. 1) College in our society is as much about “finding yourself” as it is getting an education. It is hard to put a price on living away from your parents for the first time, making mistakes that grow you stronger, or attending a football game in the student section. Who wants to miss out on that! Debt be damned! 2) Parents don’t want to tell their children that the dream of an education is not possible given there financial situation. The thought that a degree will pay for itself, and using loans to get there, is still a part of our society. One that, post-2007 is fading fast, but I’d bet is still ingrained in a lot of families. 3) Graduating High School students that have a 4 year, post high school plan, are glorified. Anyone who decides to take a different approach are looked at as outcasts. Your going to community college? Your going to a technical school? You need to stay home and work a year to save money for college? Each of those are a tough sell in our society. What kid wants to tell there friends that they can’t be a part of the glorified club of college because they don’t have enough money?! It is a tough bullet to bite. But I do think education will help. Putting $80k into real terms that an 18 year old can understand. Providing them alternative options. Help them make the right decision. Although many jobs today require higher education beyond secondary school, I would venture to guess that the ratio of the number of jobs that require higher education to the number of students with a higher education diploma has decreased (# jobs that require diploma/# students with diploma). Two of my siblings did not use their undergraduate education (majors = economics for one and sociology for the other), and the third doesn’t even use his secondary education (major = history). One is in the “1%,” another is slightly better off than the national average, and the third is slightly below the national average. They are where they are in life because of their own decisions post-college. Two of my three siblings did, however, pick up some nice addictions to narcotics while in college (everybody has to live the Greek life to have lived! ), a habit which has affected both of them, one especially. Not everybody is like this, sure, but there are multitudes of people, who had their educations subsidized to no end. Why do I bring this up? Sure, it’s anecdotal, but I think it’s indicative of a larger trend. Am I arguing whether somebody should or shouldn’t go to college? Absolutely not. I will have spent more time pursuing higher level degrees than probably 99% of people out there. I am really making an argument about supply and demand of college-educated workers: the latter has increased some, but the former has increased immensely, thus “cheapening” the value of a diploma. The decrease in the perceived value of diplomas is not only a function of the quantity supplied and demanded but their quality as well. Although I argue that the quality of a generic four-year college diploma has decreased, I admit that I base that assertion off intuition only. Why are there so many people going to college now in purely economic terms? Could it have something to do with the fact that we (I am a student) are given outrageously low interest loans on our federally subsidized debt? What about the “grace period,” when not a penny needs to be paid until the student has been out of school for six months? And if we stay in school pursuing more degrees? Then the government keeps paying our interest payments. Everybody (even in this economy) is going to college, because it is underpriced. Were it not so, then private loans wouldn’t offer higher interest rates (substantially higher) than government loans. Nor would students be able to put all payments aside for as long as they were considered enrolled for the government’s minimum number of credit hours. There are many problems in higher education, and (as a former student of economics) I believe that a major one is the subsidization of it. If a portion of the cost is rendered free by subsidization, then perhaps we will value it less, for we ourselves will not have to pay for it. Even an immature 17/18-year-old can show some of the same maturity as a grown adult, if he or she “owns” his or her education by paying for it his or herself. 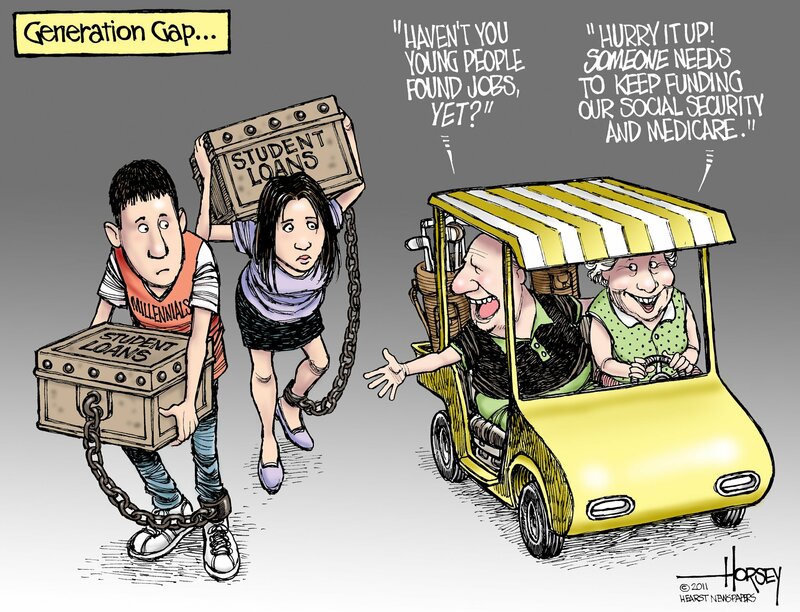 Lastly, let me just say that I am not arguing against any subsidization of higher education whatsoever (I am no expert on the subject, so I am not comfortable making such a grandiose argument), but in its current bloated form, subsidization is making the problem worse: limitless demand for college, much of which is paid for by the government, little of which is valued by its students: its customers. Unfortunately American culture regards debt as a tool for all aspects of life, there are many ways to get through college without using debt. When I first started college I paid for the first 2 years in cash that I had saved working hard in the summer time, in addition I was awarded some small scholarships as well to help me get through. When I attended the private college was when the tone changed and debt was sold in the admissions office over and over again. I was never talked to about what marketable skills I hoped to gain or what career I was looking for, rather the end result was always the piece of paper after senior year. The 1 in 2 new graduates being unemployed statistic does not surprise me because in the business of college the diploma is the goal not the career. I didn’t even start thinking about what I wanted to do with my life until 6 months before graduation because I thought people would be lining up to hire me, at least this was what I was being lead to belive. I’ll tell you, it was a 2-3 year tough lesson to learn that no one really cared about how much I had to pay back for college, what I thought I knew, or how much education I had, they wanted someone to show up and work hard. I am still paying my dues but fortunately have moved up and have been able to at least pay my loans and start to save money. One of the best things I ever did was unlearn all of the leveraging debt crap they tought in business school and refocus on a better way of managing money. I am now a huge believer in the cash system as tought by Dave Ramsey, it has helped me and my family get out of debt and is beginning to get us out from under about 60K total between my wife and I in student loan debt. I feel lucky, I am certain there are many of my generation who owe much more and are having a tough time with employment in this economy. This much is for certain, if we all continue to use debt as a “tool” to over finance college and continue the course through life I fear we are in for a rude awakening in the not too distant future. Perhaps the declining “economic value” of a college diploma is leading us towards an educational structure that was more prevalent in the early and middle part of the 20th century; when a much smaller percentage of high school students went directly into college, and instead adopted a trade or took more focused “technical” training. Speaking from personal experience and the experiences of many friends of mine, many students are leaving college with a mediocre education, average GPA, little or no work experience, and have no chance of competing in the present day market place. In my opinion, the college education has been commoditized in that everyone gets one, regardless of the quality. In the end, this results in most employers having their pick of only the best and brightest students, while the rest get pushed into unemployment, living with their parents, and suffering through mountains of undergraduate debt. In a strange twist of fate, I know many people that I went to high school with who decided not to pursue college. Those individuals are actually doing much better professionally and financially than other friends that took the college route and traded four years and thousands of dollars of debt for an education that no employer seems interested in. Maybe all this means that expectations for high school students should be adjusted so that pursuit of a college education is no longer a given. Especially when a potential college student has a very unclear picture of what they want to accomplish over the next four years (much less the next ten). I’m not saying that everyone shouldn’t have the right to give college and the subsequent job market a shot. I was once one of those average high school students that past generations would have likely not seen as “college material”. Instead, I’m suggesting that more thought needs to go into the pursuit of a college education so time and money aren’t wasted when there is no guarantee that a better job and a better life waits on the other side of undergraduate study. I graduated High School in 2008 with a sub-3 GPA. I hated just about every minute of it and I succumb to almost every distraction in the book. Like many others my age I was (and still am) lost and plan-less in regards to my future. I got a decent paying job at a grocery store the fall after graduation. I started attending community college. A couple months in I found myself testing out of one course, and dropping the remaining four. $3000 down the drain. I’ve been working random retail related jobs ever since. When I dwell on the current situation, I tend to make comparisons among my High School friends- three in particular. One is a fifth year senior attending Virginia Tech. He is in pursuit of a degree in mechanical engineering degree, but purportedly hates it and wants to work in the finance field after graduation. The second friend, who is naturally gifted in AutoCad, won a national drafting competition and began studying Nuclear engineering at VCU. He has since been strongly influenced by the world of drugs, and is, or was, heading steeply downhill. We have been out of contact for over a year. The third of these three friends has, like me, not truly attended college. He is an excellent guitarist and has for years had an obvious passion for music. He has released several albums since our 08 graduation to no wild avail. Last month he drove cross-country to live in LA in the hopes of making a name for himself. Thus begs the question, what can I/we do? Well luckily I’ve formulated a 5-point plan… ba-dum-TSH!! 1. Have patience- In a culture of instant gratification, it’s about the only thing you can truly fall back on. 2. Stay informed (VOTE)- Not just for President, keep informed locally, it’s where the change really happens. 4. Donate- don’t let the installment of class warfare stop us from being great. 5. Stay calm- there will always be stubborn people, people will always dupe you once in a while, don’t get angry and enable them. Talk to Drew would be on this list, but I assume most of you have already done so. Thanks for the read!